In college football, it’s a stretch to try and project how things will shake out by the end of November. This exercise is especially futile in the middle of August, when there’s barely a fall breeze to remind you that snap counts and passes are around the corner. Broken projections and expectations, however, are what makes this sport so fun. So we’re going to stare into the eye of chaos and laugh because insanity is college football’s hallmark. Here are some points to get excited about before madness consumes all of us in the 2015-2016 season. Jim Harbaugh at Michigan: I’m not even going to get it twisted. Harbaugh has been one of the biggest news stories in the offseason. Since his hire in Ann Arbor, the former NFL coach has been grabbing headline after headline with his quirky personality and his steadfast commitment to build Michigan to pre-Brady Hoke levels. From frustrating radio troll Colin Cowherd to perpetuating the “dad bod” phenomenon to being the face of the satellite camp controversy in SEC country, his presence has been everywhere. For those who think this is a distraction, consider the other side. The excitement surrounding the program has not been this high since Hoke’s first days. Combine this with a team that is not without bright spots, and things may be looking up. It may be especially interesting in the Big Ten West, where there’s no clear division favorite since Gary Andersen fled Wisconsin to go to Corvallis. The Race for the Pac-12 South: In 2014, the Pac-12 South race was a wild gauntlet that seemed like it would only end on whomever stumbled into the winner position. In the end, Arizona benefited from UCLA falling to Stanford and beating Arizona State in a punch-for-punch rivalry game. This year, the same looks to remain true among the three teams with a possible bid from Steve Sarkisian’s USC. Arizona State and UCLA are the front-runners; both returning a lot of talent at skill positions to make a run through the lesser teams of the division. Yet, there’s always a chance that either USC or Arizona could once again benefit from nose dives by either of the top teams. 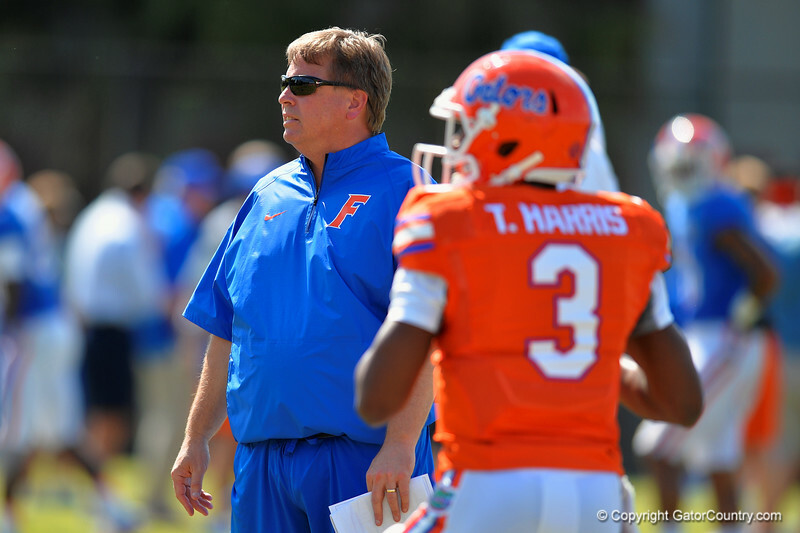 The McElwain Rebuild at Florida: The Gators’ identity shifted away from the innovative offenses of Steve Spurrier and Urban Meyer when Will Muschamp was hired back in 2010. Now, Florida is more known for its A1 defensive squads than its offense, which has become hapless at best and downright incompetent at worst. The second biggest coaching hire of the offseason, which resulted in some TMZ-style journalism, was designed to remedy all of that. Enter Jim McElwain, Colorado State’s former head coach with Nick Saban bonafides from his days as an offensive coordinator at Alabama. The expectations are notably high for the coach’s first year, but he’s tried to temper those hopes with doses of reality. With an SEC East that is slowly rebounding in parity, McElwain’s first year might be a joyride or a collision. Can Baylor Finally Ascend to Playoff Valhalla? : Art Briles is one of the best coaches to watch during press conferences. The pettiness and salt that colors his media appearances is up on a level with his favorite rapper, Aubrey Graham. He even resorts to a level of shade that is so subliminal that it might as well be a Drake track. His bitterness over being left out of the playoff conversation is still running at such an all-time high that it might spill over to next season. It might be a good thing, as Baylor returns star players like sophomore receiver KD Cannon and running back Shock Linwood. Their schedule is an easy trot through the first half, with question marks in Norman, Stillwater, Manhattan and Fort Worth in the back half. But, given the fact that Baylor is returning so much of its fire power while others carry major question marks, the Bears might be able to clear the final hurdle of their quest for a national takeover. Is Three the Magic Number for Bret Bielema? : Under Bret Bielema, Arkansas has shifted from the fast-paced, mostly airborne Bobby Petrino system to a ground game that pummels opponents like a battering ram. The returns for Bielema with the identity change have been steady. In his first year, the Razorbacks went 3-9. Last year, Arkansas went from laughing stock to a team which ground LSU and Ole Miss to bits on the way to their first bowl game since Petrino abruptly left. In their bowl game against Texas, they became the fully formed sadistic vision of Bielema. This year, Bielema returns Jonathan Williams and Alex Collins, a tandem that can run through brick walls. With a slightly thin defense, they’ll need to control the pace of the game in order to get by a slate that includes away games at Tennessee, Alabama, Ole Miss and LSU. The Hogs are definitely long shots to win the SEC West division, but the reward for an above-average season will definitely help Bielema sustain the success he has had at Arkansas since the madhouse days under John L. Smith. Will Clemson Do That Thing That Clemson Does? : Clemson is currently slotted in the 12th spot of the Sports Illustrated rankings. Statistics wizard Bill Connelly seems to think that Clemson could win the ACC. Yet, all of it depends upon the health of DeShaun Watson. Watson, who made his start in 2014, accounted for 1,466 passing yards and 14 touchdowns for the Tigers when he wasn’t injured. Considering he was injured for seven games, those are good numbers. With a Brent Venables defense that managed to stifle most of the ACC last year, Clemson is in prime position to be the favorites if Watson remains healthy. Even if Watson stays on the field, and the defense plays out of their minds, the question still needs to be asked: will Clemson “Clemson?” There is no definitive answer, but there are plenty in Columbia responding with a resounding affirmative. Possible Return to Form at Stanford: Stanford sunk to its lowest point in the David Shaw era when the team went 8-5. After three years of winning over ten games and sharing the Pac-12 North crown with Oregon, Stanford finally looked like a division also-ran. It seemed that the Cardinal couldn’t close games out and lost a bit of the kill factor that defined its muscular dominance in the division. This year, despite losing nine defensive starters, Stanford looks to rebound with a refined passing attack led by senior quarterback Kevin Hogan. It might be quick to write-off Stanford with all of its losses, but defense has been a hallmark in Palo Alto ever since Harbaugh’s tenure. 2015 may mark another testy two-way battle for the Pac-12 North between the athletic skill position of Oregon and the overpowering brawn of Stanford.